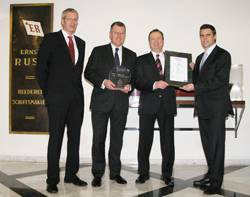 (from left to right): Dirk Lange, Germanischer Lloyd, Stefan Bülow, Reederei Ernst Russ, Jan Stahmer, Reederei Ernst Russ, and Matthias Ritters, Germanischer Lloyd, at the presentation of the "GL Excellence - 5 Stars" Certificate. The shipping company Ernst Russ strives continuously for the highest quality, safety and environmental standards in shipping; in recognition of this it has now been awarded the "GL Excellence - 5 Stars" certificate by classification society Germanischer Lloyd (GL). Ernst Russ Managing Director Mr Stefan Bülow and Mr Jan Stahmer, Health, Safety, Environment und Quality Manager, were presented with the firm's certificate by GL this week, making the Hamburg shipping company only the ninth ship-owner in the world to receive this prestigious award. "Commitment to the highest safety and quality standards is a prerequisite for successful collaboration with our international partners and clients. This is why we are particularly delighted that this award underlines our approach," said Mr Bülow, CEO of Ernst Russ, as he received the certificate. International standards and management systems continuously optimise and oversee the safety, environmental compatibility, and operating processes of ships. Companies can document their efforts to comply with these standards, both mandatory and voluntary, through "GL Excellence" certification by Germanischer Lloyd. This provides independent proof of their commitment to the sustained improvement of their quality, environmental behaviour, reliability, safety and social responsibilities. Ernst Russ' fleet meets the requirements of the ISM Code (International Safety Management), of the ISPS Code (International Ship and Port Facility Security), of the ISO 9001 (Quality) standard and also of the ISO 14001 (Environment) standard. Practical ISPS Code exercises for averting danger (such as piracy) are regularly carried out by the firm with the GL Academy. As a subscriber to GL's Emergency Response Service, the shipping company has extensive technical support on hand for any emergency. Comprehensive in-house basic and advanced training measures in the areas of environmental protection and energy efficiency, as well as the use of intelligent software solutions (GL Crew Manager) in combination with extended training measures in the operational area, set above-average benchmarks and are evidence of a future-oriented and reliable shipping firm. By fulfilling the obligatory requirements (including at least five management systems such as ISO 9001, ISO 14001, health and safety management system, Maritime Social Responsibility Standard, ISM and ISPS), the shipping company is entitled to "GL Excellence - 5 Stars" certification. Ernst Russ has received this award for its entire GL classified fleet. Compliance with "GL Excellence - 5 Stars" certification is checked every three years alongside the ISM and ISO audits.